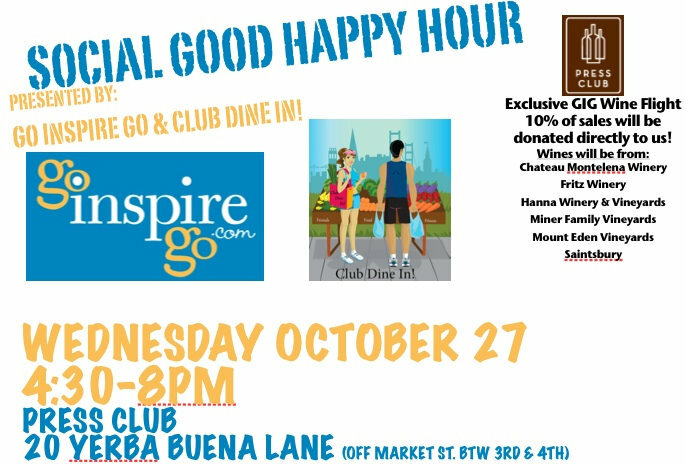 Social Good Happy Hour Oct 27th | Club Dine In! Go Inspire Go and Club Dine In! invite you to a pre-Halloween Social Good Happy Hour. Celebrate the start of the holidays by doing social good, mingling with old friends and making new ones! Club Dine In! is a lifestyle community for people who enjoy socializing around food and still strive to be on the path of wellness. Join Club Dine In! on Twitter for daily health, fitness, and social news, recipes and delicious tips! Join the Club Dine In! community on Facebook to connect with like-minded individuals and find out about exclusive Club Dine! events. Being a part of Club Dine In!’s community is free. Click here to learn more about Club Dine In!